Flushing solution can be used to recover printheads that show signs of blockage. This is done by loading a flushing solution into the printhead assembly which can breakdown lodge particles and clean the nozzle paths in the printhead. This guide will explain how to flush a PM-836 and PM-417. This process will flush all four printheads. As we cannot flush a single color at a time due to firmware restrictions, flushing the entire assembly is more cost effective as flushing solution is much cheaper than ink is. This process is the recommended process regardless if other colors are printing normally. From the maintenance utility, print a nozzle check pattern to identify problem printheads. In the below picture note that the yellow printhead is not firing most of its nozzles. 2. 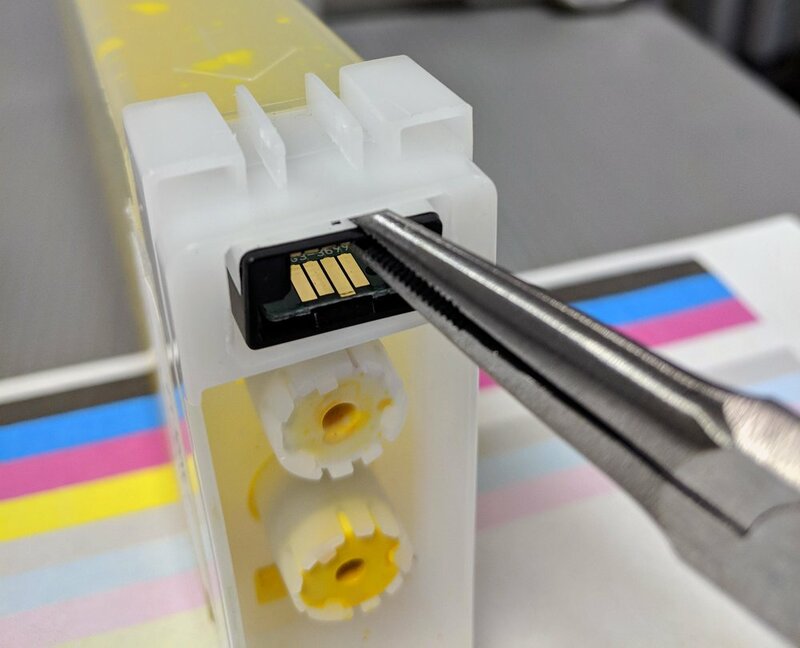 Start by removing the yellow cartridge - not that this process will be repeated for all four colors but it is recommended to go one at a time to ensure the chips are not mixed up. 6. Install Flushing Solution into yellow ink tank box. Repeat this process for Magenta, Cyan, and Black so that all four colors have flushing solution installed. The system will begin its ink loading process which can take up to 30 minutes. During this process you can monitor the status in the printer status window. 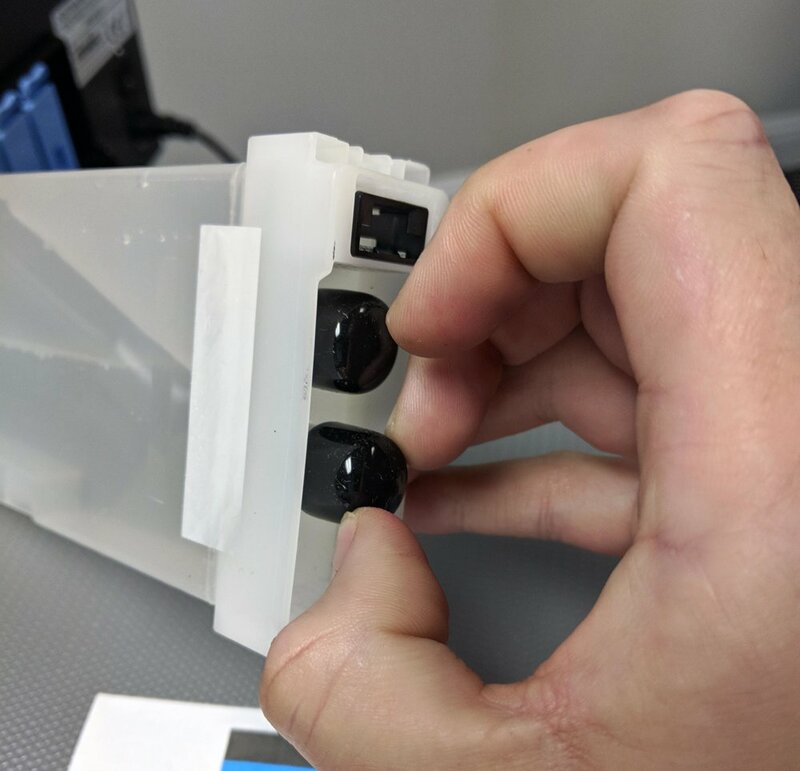 It is possible that a Fatal error can occur when using flushing solution instead of ink, this is normal and indicates the flushing solution has filled the printhead. The error usually occurs as the clear flushing solution cannot be detected by the printhead. This error can be detected in the bottom corner of the status window. After about 20 minutes the printer will either have completed the ink loading cycle or will show a fatal error. If the status of the printer shows online / ready run another ink loading cycle. If the printer shows a fatal error, power cycle the printer. The printer will either automatically start an ink loading cycle or show online / ready. If it shows online / ready run another ink loading cycle. The above two steps should be repeated until the cartridges of flushing solution are completely depleted or the majority of the waste ink is coming out clear. 10. Once the system has been flushed, power off the printer. 11. Starting with the yellow cartridge, remove the flushing solution. 12. Remove EEPROM chip from flushing solution cartridge. 12. Reinstall EEPROM chip in cartridge of color that was flushed. 13. Reinstall cartridge into printer and repeat this process for all four colors. It is recommended to insert full cartridges into the system. 14. Power on the printer. If an error occurred during the flushing process, the printer should begin the ink loaded process automatically. If it does not, navigate to the troubleshooting tab of the maintenance utility, and click the ink loading button once again to load ink. 15. Once ink loading is complete and the printer status shows online / ready, print another nozzle check pattern to verify results of flushing the printhead. If the color density looks light it is recommended to run a strong cleaning cycle on the printer. If the density still looks light after a strong cleaning, run another ink loading cycle to fully evacuate any flushing solution that may be in the printhead .